Make sure your housing is watertight before you get in the water. What-s in the Nikon D500 camera? Aquatica designed the AD500 housing by carefully selecting the features that will improve performance for underwater imaging. Aquatica then ergonomically placed the vital controls where they were most needed, right at your fingers tips. At the core of this housing design one can trace over 30 years of expertise in this field. Years of knowledge that have pushed us forward in incorporating new ideas, concept and technological advances to these constantly evolving imaging tools. Handling is made with a pair of grips that have become the bench mark in comfort since their introduction over a quarter of a century ago. These grips are a perfect example of Aquatica-s philosophy, change should be implemented to improve a product, and not for the sake of novelty, when grips are as perfect as these are, leave them alone! Aquatica's grips are light, sturdy and form fitting. They contribute to making your underwater photography experience more pleasing and comfortable. Mounting points on top of them allows strobes arms, such as those from Aquatica's Delta 3 line, to be mounted securely, freeing the top of the housing from unnecessary clutter. 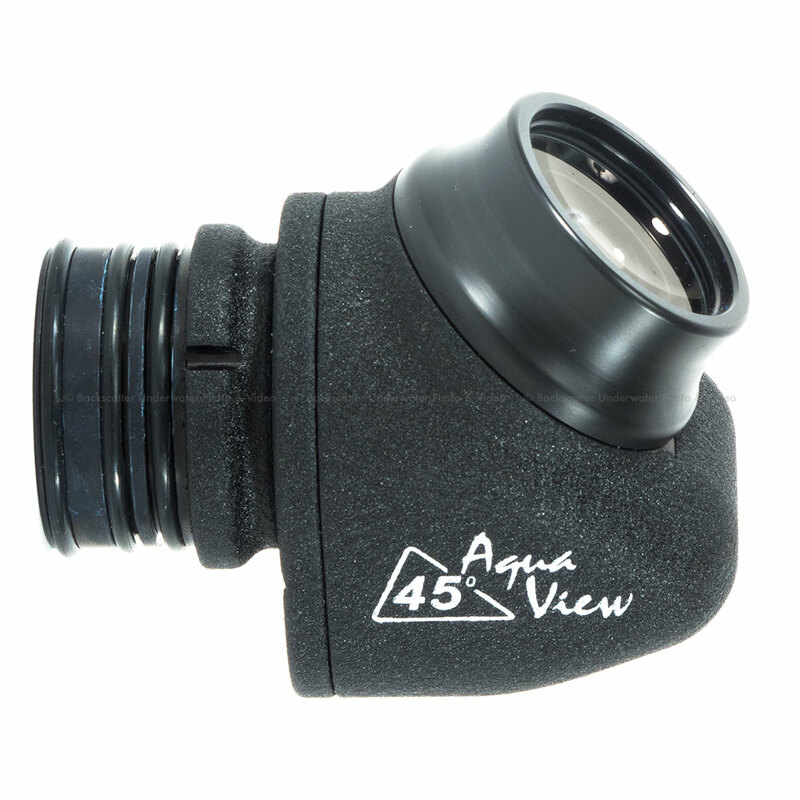 This AD500 housing version features Aquatica's optional integrated TTL converter circuit board which is compatible with a wide range of underwater strobes. This converter is offering both automatic strobe exposure, either through optical relay using optical fiber or via standard and readily available electrical sync cords from your strobe manufacturers. 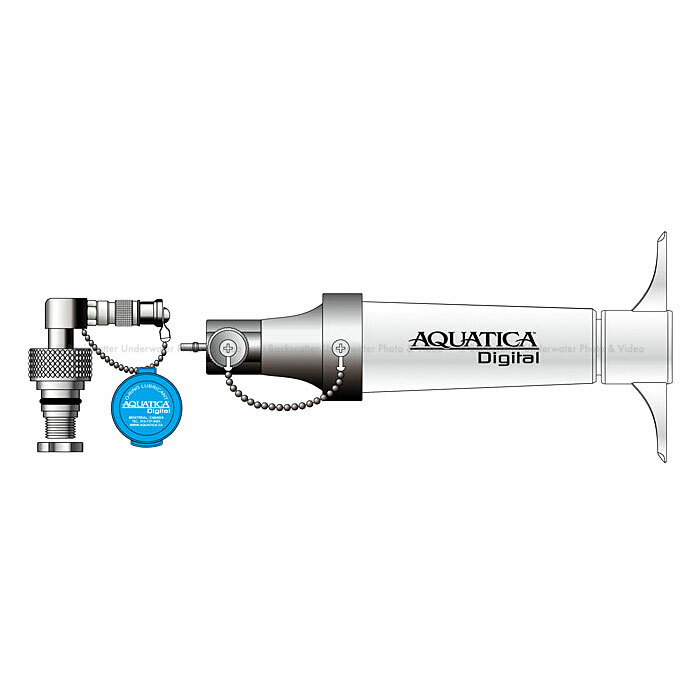 Alternating between types of triggering is an easy affair, even in the field, with Aquatica's easily replaceable bulkhead strobe connector design. Included with this optically set up housing version is the LED flash trigger. This LED trigger is powered by two popular -off the shelf- CR 2450 batteries and averaging 4,000 to 5,000 burst of light. This LED trigger slides into the hot shoe of the camera like any other hot shoe accessory would. The 20080-OPT version of this housing is ready to accept standard optical fiber sync cable commonly found on the market, there is no need for special proprietary or custom type cord, the optical fiber cord supplied by the strobes manufacturers are ready to use as is. This version is set up with a pair of time proven Nikonos bulkheads connectors, the same available on all Aquatica's current DSLR housings. It is a well-established standard, which has been the back bone of strobe technology for decades and still by far the most distributed type of strobe connectors in the whole underwater photography industry, every strobe manufacturer offering then as a means of connection. This 20080-NK housing comes with not one, but two of these connectors installed. These, as well as the optical ones are easy to replace in the field, should one decide to alternate between way of triggering their strobes, no special tools are required and the operation is done in minutes. The Aquatica AD500 uses their excellent line up of existing ports for the DSLR line of housings. And simply put, a lot of effort has gone into giving you access to the most appealing lenses for this camera with the best port combination for them. Since ports are such a vital part of the optical formula in any underwater photographic system, Aquatica have built one of the most comprehensive selection available for underwater imaging. Aquatica's flexible modular system of extension rings, dome and flat ports is ready to face the challenge of constantly evolving lenses coming out on the market. The irreproachable optical quality of these ports have long made them the choice of demanding professionals from around the world. Wide angle imaging requirement can be addressed with dome of 4in/100mm, 6in/150mm, 8in/200mm and 9.25in/230mm, from ultra wide angle close up situations to top quality over/under images. Aquatica's dome ports have you covered. 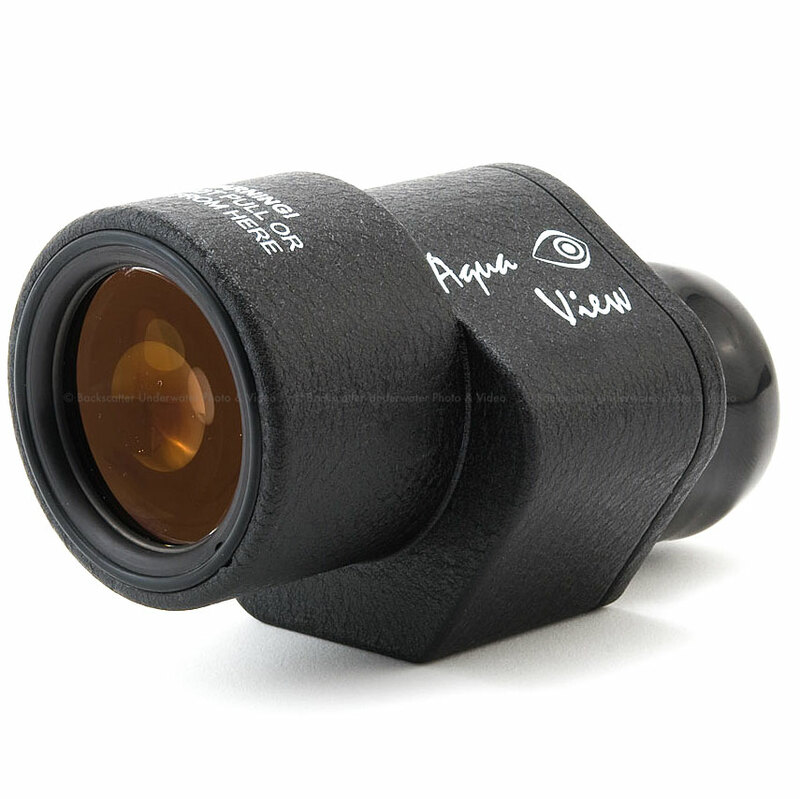 Macro imaging needs can be fulfilled using Aquatica's recently introduced Mini Macro port, a vital part of the Aquatica ACU System, this port has a narrow frontal signature making lighting in tight corner easier. A bayonet mount is located on its front end for attaching Aquatica's convenient ACU system flip holder with the potential of attaching up to two ACU wet diopter close-up lenses. Tying the port system together are a set of fourteen locking extension rings, ranging in length from .65-/16.5mm to 3.82-/97.5mm. Port extensions are strategic partners in the optical chain, they serves two purposes, in the case of wide angle lenses, it helps optimize the performance of wide angle lens by properly placing their optical center with that of the dome port and for macro lenses, it give added length for accommodating longer focal length lenses such as the 105mm, or when using internal accessories such tele converter which may contribute to the added magnification of a given lens. The Aquatica AD500 comes standard with Aquatica's own Surveyor moisture and vacuum monitoring sensor circuit installed at the factory. The housing can also be ordered with the optional pressure extracting valve and pump installed at the factory. The visual and audio signal will attract your attention should any of the O-ring become damaged or hindered by sand, hair or any foreign objects that would compromise the sealing integrity of the housing. All that is required are a few simple steps for your peace of mind and knowing that your equipment is safely protected from the environment. Securing of the housing is done with time proven stainless steel latches equipped with safety tabs. These are non-gimmicky, their solid track record has demonstrated that what they lack in fashion style, they more than make up in resistance to failure, jamming up or corroding over time. Chosen as a standard mean of securing highly valuables assets and equipment by scores of sensitive scientific and military equipment manufacturers, this method of securing is beyond reproach when it comes to reliability. Their simple and efficient design makes them reliable and they are a reflection of Aquatica-s commitment to rely on time and field proven technology. At the core of the design is the shell, designed on cutting edge software by dedicated individuals, machined on state of the art 5 axis CNC machine from a solid block of 6061 T6 aluminum alloy, the same routinely used in aerospace technology. This alloy is acclaimed for its high resistance to corrosion. 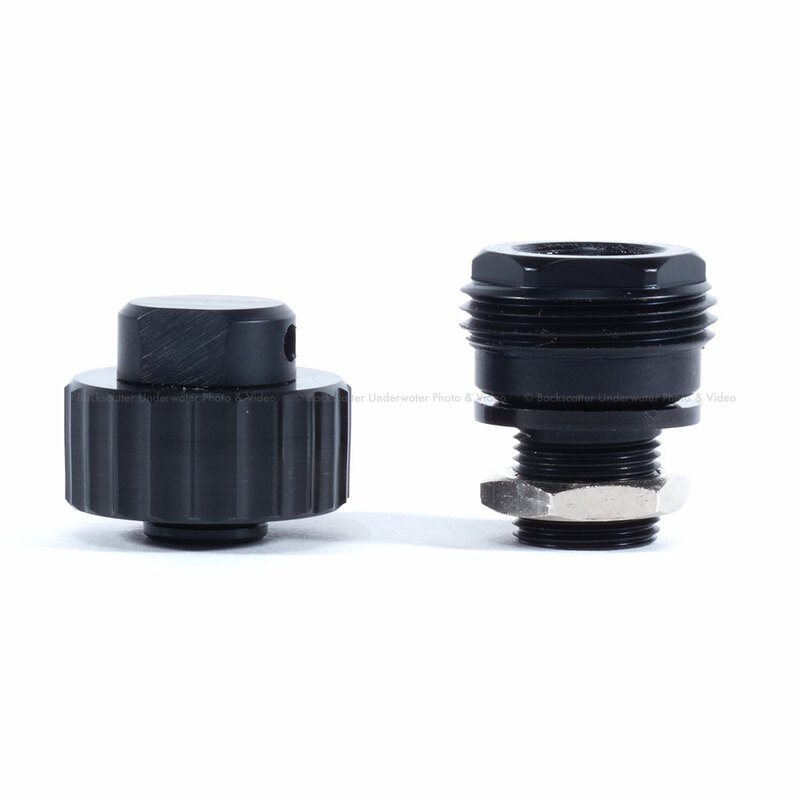 The shell is then anodized to a MIL-A-8625 Type 2, Class 2 speciation, and finally covered with a tough as nails, black polyester powder coating baked at a high temperature in order to be certified certified to A.A.M.A 2603-98 specification. This kind of protection is not superfluous, as evidently shown on Aquatica housings having logged over 3,000 immersion and which are still on active duty day after days. The housing shell has two entry points for connecting strobes plus two others for adapting various accessories. There is a large 16mm diameter access point on the left hand side, ideal for connecting a monitor. 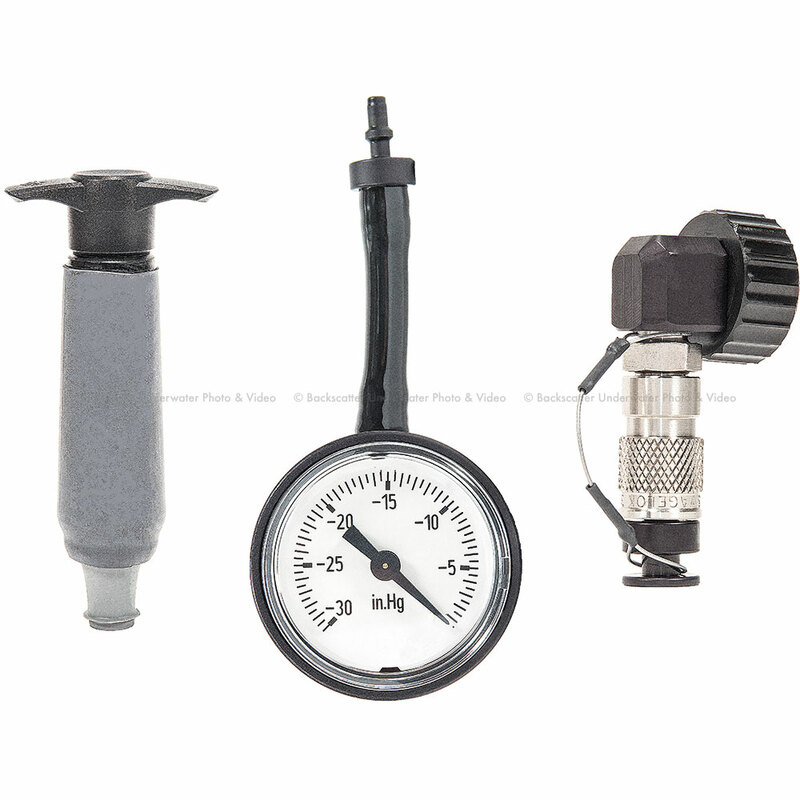 Also located on the left hand side is a standard 1/2- diameter access point for the optional Surveyor pressure valve. Well established and proven system of ports, extensions and accessories to attend to your personal lens preferences. Quick and simple installation of enhanced viewfinders; no special tool required. The best selection of strobes connectors on the market. The most comfortable and sturdy hand grips of the industry, also extendable for larger or gloved hands. Eight (8) threaded standard ¼--20 holes, one located on top, three on the bottom and four on the grips, to mount strobe arm, brackets, tripods and a wide range of accessories. Depth rating options of 90m or 130m depth at no extra charge. Made with a time proven manufacturing process, using the best material available and state of the art tooling, to offer you many years of dependable and enjoyable service.